Bill O’Reilly set the frame for an “angry white male” understanding of the bath Mitt Romney took at the polls Tuesday night, even before it was entirely clear to Fox Cable News that their guy was going down. O’Reilly’s premises, that “whites” are “50%” of the population and don’t want “things” from “the government,” are false. Euro-Americans considering themselves “white” are 72% of the national population. 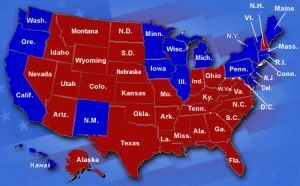 Moreover, it is well-known that the Republican “red states” receive the most Federal aid. These states are less racially diverse than the highly urbanized “blue” states, and so are full of white people. “Tax policy is tilted in favor of the wealthy members of the Forbes 400 list. What is the “white establishment?” Perhaps O’Reilly is referring to the WASP elite, or the self-described White Anglo-Saxon Protestants who dominated business and government for the first 170 years of the Republic. That elite has been losing its virtual monopoly on power for some time. (WASP, by the way, as historians originally used it, did not refer to just any white Protestant of English heritage, but rather to a specific set of extended Northeast families; poor English-heritage Baptists in the South were not WASPs and neither were German-Americans. On the other hand, puzzlingly, Scottish-Americans were part of the elite, even though Scots were not thought of as Anglo-Saxons). It is ironic that O’Reilly, whose father’s family was from County Cavan, Ireland and whose mother’s family was from Northern Ireland, should pose as a champion of a WASP establishment in decline. When the Irish, Poles, Italians, Jews and Lebanese first came to the US from the 19th century through 1924, they were not treated socially as “white” by the Protestants even though they enjoyed the legal status of whiteness for the most part. Roman Catholics of Irish descent faced significant discrimination in the US in the nineteenth and early twentieth centuries In short, who is considered fully “white” has drastically changed over time in the United States. In reality, there is no white “race” (or any biological races at all in the 19th century sense of race– we’re all 99.9% the same genetically). America’s arbitrary racial categories are fluid and changing social constructs. With the election of John F. Kennedy and subsequent developments, some Catholic Euro-Americans were allowed into the white elite (they now account for six of the Supreme Court Justices and both vice presidential candidates this year). And maybe it is this joint Protestant-Catholic Euro-American elite of more recent vintage whose demise O’Reilly regrets. Except that if we look at the composition of the 2010 Congress, for instance, we find that it was 57% Protestant and 29% Catholic and 7% Jewish. The general population is 51% Protestant and 24% Catholic, so that these two branches of Christianity are actually over-represented in the political class. And, Episcopalians and Presbyterians, the members of the old WASP denominations, are over-represented among the Protestants. Only 43 members of that Congress were African-American, i.e. less than 10% and less than their proportion in the general population. 28 members were Latinos. Women held 90 seats, or about 17% and were obviously grossly under-represented in favor of men. If Congress is an indication of the political class’s make-up, then the white establishment seems well ensconced. Likewise in the Supreme Court and in state legislatures and other state high offices. So what is really going on is that a small male, Euro-American elite along with white constituents in the Red States have been robbing the rest of us blind and dominating our politics for decades. The white vote was 72%, of which Obama won four tenths, or 29 percent of the total vote. That 40% of the white vote, though, was very disproportionately white women. Then of the 21 percent of voters who are non-white, Obama picked up all the African-Americans and 2/3s of Latinos and Asians. (Some 7% of the voters appear to have refused to identify in exit polls as white or non-white and I suspect Obama got most of them, too). So that gave him the lead over Romney. It is true that Obama could not have won with only 40% of the white vote, and only 33% of the white male vote, in 1996. But what has changed is not that minorities are now half the electorate or that minorities plan to loot the government. What has changed is that the rest of the country is asserting itself against a small, patriarchal and oligarchic class that had unfairly dominated politics and business and received the lion’s share of government largesse. What has happened is that America is democratizing, and people want a fairer system than dominance by male WASPs.